Gong xi fa cai! Chinese New Year is in just a few weeks! I'm sure you've seen the wares already. Pineapple tarts are one of the must-have items, but I've been quite jaded with what's out there. But here's something quite different - a golden brick, and what a delicious one it is. 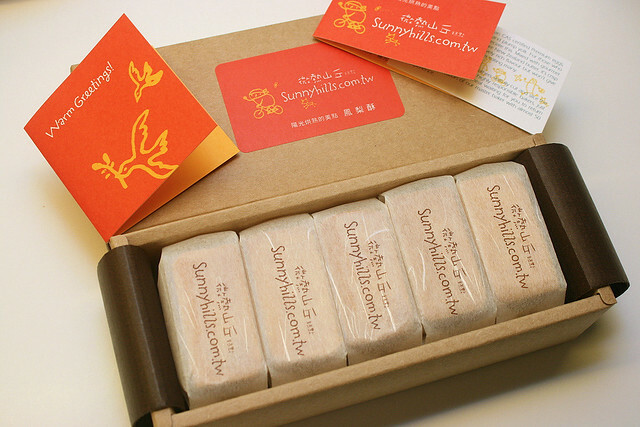 Sunnyhills 凤梨酥 (feng li su) pineapple cakes from Taiwan are now here in Singapore. I am not familiar with anything Taiwanese apart from Acer, so I don't know if these are a famous brand or cult favourite there. But famous or not, they sure taste pretty good. I love the buttery fragrant golden crust - it's got the right amount of salt for a savoury punch. And the generous pineapple filling has a suitable balance of sweet and tart, without being overwhelmingly sweet. The pineapple's also got texture, but it's more like moist, firm pulp rather than annoying fibre. 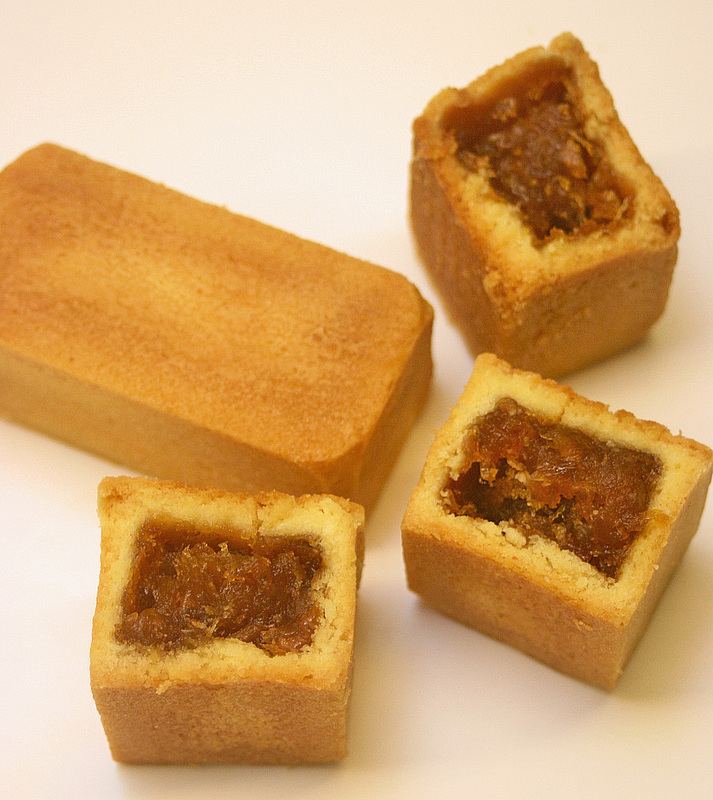 These cakes are made with Cayenne pineapples organically grown on the plains of Ba Gua mountains in the Nantou County. They use gourmet baking flour from Japan and pure New Zealand butter. They bake the cakes using traditional methods and proudly call these "Sunny Bites". And they are big - each one is at least two or more pineapple tarts, and I reckon they are similar or bigger in mass than the golf-ball sized ones from Le Cafe. But despite the huge size, I found it hard to stop at just one! Oh, if you toast them a little, they will taste like they're fresh out of the oven! Some people actually like to eat them frozen even. Yeah. The cakes come elegantly and individually wrapped, all in a nice sturdy gift box too. Call +65 8522-9605 or email services@sunnyhills.com.sg for more details. Free delivery for orders above S$90. Those above S$180 receive a complimentary box of 10pcs. Sunnyhills believes in letting customers try the products first before buying. In fact, at their shop in Taiwan, every guest is given a cake and tea, whether they buy or not. If you'd like to sample some, look out for them at the Funan IT Mall Food & Lifestyle event from 17- 31 January 2011. Many thanks to Sandy at Sunnyhills for sending me these. They are pretty much the only ones making pineapple cakes with actual pineapples for the filling. Almost everyone else just uses candied winter melon. I bought a box today and my parents say it's very nice! Thanks for the recommendation! Ouch, my sweet tooth is acting up again! Try Jane's Cake Station's pineapple tarts (currently available at Taka basement 2 where all the new year goodies are), heavenly! Really does melt in the mouth. There's durian tart too. However, I find that the durian gets lost in the pastry...perhaps the butter is overpowering? By the way, the tarts are only available at Taka, Jln Kayu is only selling the cakes.